Insourcing vs. Outsourcing: What’s the Right Option for You? You may be considering bringing more functions in-house, but be sure to consider the real costs. Historically, OEMs have made a distinct effort to become more and more vertically integrated. Whether it was injection molding, sub-assemblies, packaging, machining, or even sterilization, companies are prepared to pay large sums of money to bring these technologies in-house. The rationale for doing so is relatively easy to justify: greater perceived control of the supply chain, quality, cost, lead times, etc. However, over the last number of years, this line of thinking is changing. As companies bring more and more activities in house, they face new challenges. With each new technology, a new skill set is required: additional hires, additional training, maybe even additional shop floor square footage. Once in place, each activity needs to justify its existence from a financial standpoint. What is its utilization rate? What’s the ROI? And what is the actual running cost? Overhead. Bringing more activity in-house leads to an increase in overhead, in particular your fixed labor costs and potentially energy costs, depending on the activity in question. Labor force utilization. Creating value is the most important aspect of any company. This value is created through having your workforce focused on making your product. Insourcing an activity such as packaging and fulfillment will inevitably divert a portion of your labor force away from this and lower their overall contribution to the bottom line. Options. Once you take the plunge and insource a technology such as injection molding, you are less likely to expose yourself to the limitless offering of the marketplace. R&D decisions around product design can become limited by the capabilities of your newly sought insourced technology. Access to foreign markets. When you outsource part or all of your manufacturing process to a contract manufacturer with a global footprint, not only do you gain access to lower labor rates, you also gain local knowledge and a trusted portal to sell your product abroad. Exposure to the latest and greatest manufacturing processes. It’s worth bearing in mind that by the nature of its business, a contract manufacturer is challenged with processing a whole variety of different devices on a daily basis. This drives the contractor to remain at the forefront of technology in order to stay relevant and economical. This exposure to different markets and products can only improve its processes, and, ultimately, it’s the customer that gains from this knowledge base. Control of overhead. As discussed above and possibly one of the largest contributors to the shift toward outsourcing in recent times is the control it offers over overhead. We know that demand fluctuates; one week you need 40 people working on a cell, and the next week you don’t need any. In the insource model, these 40 people remain on your books as fixed cost regardless of whether they are needed or not. In the outsource model, you simply turn on and off the overhead as and when required, thus leading to a much leaner cost base. It’s imperative that you do select the right contract manufacturing partner. To be a successful relationship, the contractor needs to be seen as an extension of your very own production team and perform as such. To see whether your company could benefit from outsourcing, please stop by SteriPack’s Booth #2106 at the upcoming MD&M East show June 12–14 at the Jacob Javits Center in New York. David Moore serves as business development manager for SteriPack Group. 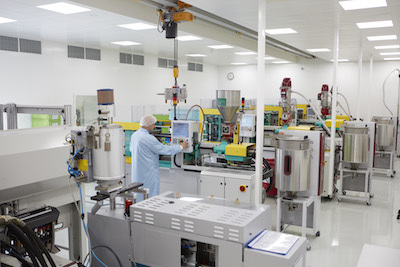 SteriPack provides cleanroom contract manufacturing services, with ISO Class 7 and 8 manufacturing facilities located in Ireland, Poland, Malaysia, and the United States. 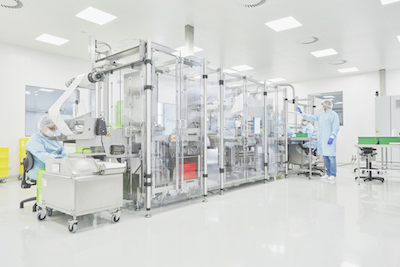 Offering product design and development, combination products, injection molding, form-fill-seal, as well as pharmaceutical blister packaging services, SteriPack can offer end-to-end solutions from concept to commercialization. Is Medtech Ready for an On-Demand Manufacturing Model?